Our last blog focused on the rising trend towards performing percutaneous coronary intervention (PCI) transradially, or vascular catheterization via wrist access, in the United States. As medical professionals continue looking for ways to improve patient care, the adoption of transradial access (TRA) grows because of the well-documented patient benefits. There is significant evidence that TRA offers clinical benefits for patients, including fewer major bleeding and vascular complications, reduced incidence of other adverse events and faster discharge1. Transradial procedures can be performed safely and effectively using either the left or right radial artery for vascular access. However, the benefits to patients associated with radial procedures come at a cost to operators. The RADMatrix study determined that physicians receive higher doses of radiation during radial procedures2. Today, right TRA has become the preferred method of radial access most likely due to the fact that physicians and staff are comfortable with equipment manipulation from the right side; as most labs are set up for right-side convenience. Left TRA is oftentimes ergonomically awkward for the operator but could offer clinical and operational advantages. Access via the left radial artery could simplify radial procedures due to less subclavian tortuosity and a lower incidence of radial loops, compared to the right radial artery. Additionally, the anatomy of the aortic arch makes LTRA similar to transfemoral access, meaning less experienced operators may feel more comfortable with a left access approach because guide catheter handling is similar to the more familiar transfemoral approach3. A patient’s medical history is an important consideration when determining whether to approach radial PCI via the left or right. Left TRA has been shown to be beneficial for coronary artery bypass graft (CABG) recipients4 because the ostium of the graft is in line with the catheter path, simplifying catheter engagement and minimizing difficult catheter manipulation. 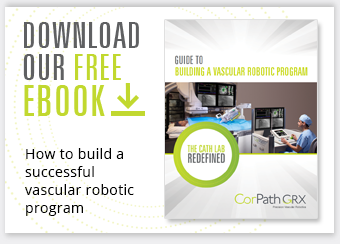 Advanced healthcare technologies such as vascular robotics can provide a solution to the concerns surrounding transradial PCI by allowing physicians to protect themselves from the radiation and orthopedic occupational hazards in the cath lab while continuing to enhance patient benefits. Corindus' CorPath GRX System enables physicians to work comfortably from a radiation-shielded workstation which eliminates the need to wear heavy lead and reduces radiation exposure to the primary operator by 95%5. The use of robotics during radial intervention provides patients the benefits associated with radial access coupled with the advantage of robotic precision including sub-millimeter measurement and 1 millimeter positioning, which may improve clinical outcomes. Additionally, robotic-assisted PCI can facilitate increased adoption of left radial to further benefit patients. 1Nathan S, Rao SV. “Radial versus femoral access for percutaneous coronary intervention: implications for vascular complications and bleeding.” Curr Cardiol Rep. 2012 Aug;14(4):502-509. 2 Sciahbasi A, et al. Radiation Exposure and Vascular Access in Acute Coronary Syndromes: The RAD-Matrix Trial. J Am Coll Cardiol 2017;15(4):209-213. 3Sciahbasi A, Romagnoli E, Burzotta, F et al. Transradial approach (left vs right) and procedural times during percutaneous coronary procedures: TALENT study. Am Heart J. 2011;161:172-179. 4Amin A., et al JACC Cardiovascular Intervention 2017;10:342-351. 5Weisz G, et al. Safety and Feasibility of Robotic Percutaneous Coronary Intervention. J American College of Cardiol, 2013, Vol 61, No. 15: 1596-1600.